Fits up to chest size 42"
Give me a O, give me a W, Give me a L! What does that spell? OWL! And, the crowd goes wild! You can hear the cheering from miles away. 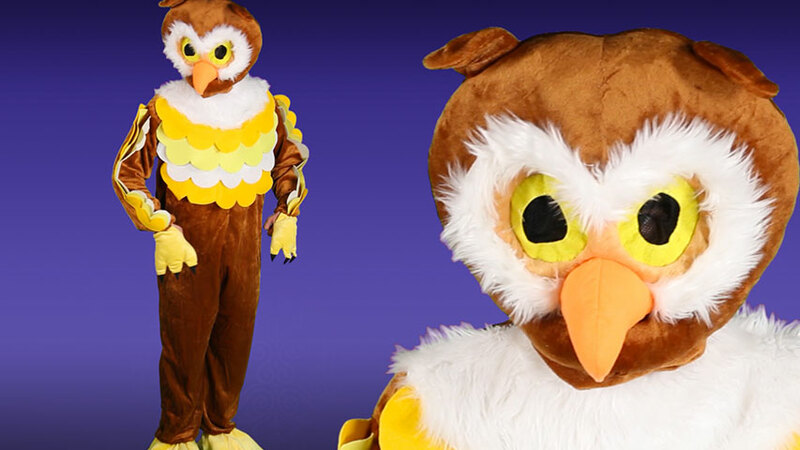 Get the fans cheering like crazy for the owls with this Give A Hoot Owl Mascot Costume. Whether it be football, basketball, hockey, soccer, rugby, lacrosse, track, or any fun event the fans will fly the coop with excitement when they see the owl mascot fly in. 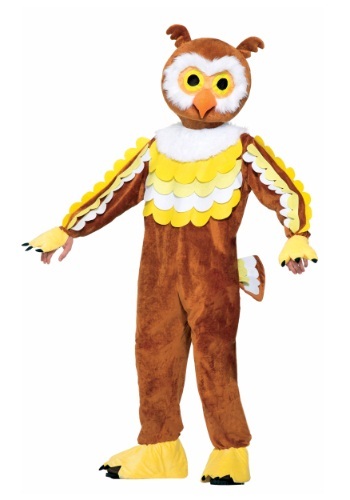 Perfect the art of swooping and dancing to the beat for an owling good time! An animal known for wisdom, and ancient knowledge, and awesome hunting ability. These nocturnal animals have intense night vision that any human would envy. That is why having parliament (pack of owls) for a team is so cool! What will you be getting to transform you into an owl? The Give A Hoot Owl Mascot Costume has a furry jumpsuit with a zipper and tail. Mitts, or should I say wings that fasten to hands with elastic. Shoe cover talons for hunting, or dancing,to entice the crowd. A plush headpiece with mesh over the eyes for keen vision, and a slit over the mouth for loud cheering. The fuzzy chest fits up to a size 42". Master the art of graceful owl movements while looking good. Go shake your tail feather and get the fans cheering!